What is Agility Training for Dogs? How to teach agility for dogs at home? How to build an A-frame agility ramp for dogs? How to improve a dog's agility performance? How high should be the jumps for dog agility? Should I purchase dog agility equipment kit or individual items? Dog agility training is an exciting recreational sport for the dogs which helps in the development of physical and mental growth of the pets and its owners. Performing agility training at home is not just fun, it will further strengthen the mutual bond and make a dog a sports athlete. But what are the home agility equipment needed to get started? Agility training for dogs is not a sport where your dog can compete and win a fashionable ribbon. Instead, it is the key that strengthens the bond with the dog. Dogs are not only for playing at the park or throwing and catching balls; they can become good athletes as well. One such famous athletic sport for dogs is Agility. It is one of the best canine sports to communicate with the dogs, instill confidence, and burn off some of the pent-up energy. Canine agility involves a dog running and crossing all the obstacles within a set time. There can be several obstacles in agility like tunnels, see-saws, ramps, and hurdles. The dogs are trained to compete in their own record set of time and with other dogs. This trending canine sport is usually practiced in big dog clubs with proper training, exercise and precautions. But performing home agility will not only be fun for the pets but as well boost up their confidence level. Agility for dogs is one such sport which includes training of both the owner and dog both physically and mentally. The dog handler is responsible to verbally guide the pet to overcome all obstacles through the tunnel, weavers, etc. while running along with them. One crucial feature of agility is that all breeds can participate provided that the agility course is tailored according to their size and height. Dog agility is a canine sport wherein the dog has to go through a series of hurdles and obstacles on the race course within a set duration. In dog agility, there is no food or toy as an incentive, and the handler can only motivate the dog with his voice. He/she will be forbidden to touch any obstacle or the dog. Agility for dogs aids in developing better communication between the handler and the dog as during learning, the dog gets accustomed to the handler’s gestures, body signals, and voice. An agility course will comprise a series of obstacles, and the course can be made of grass, rubber, dirt, or any special matting. The designing of the course and obstacle can be tailor-made based on the size of the dogs participating. This interesting canine sport can be as well performed at home with a bit of backyard dog training. For practicing home agility training for your dog, one needs enough space in order to set up the race course. Next thing that comes in for agility is the obstacles. 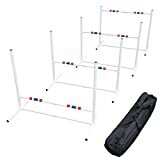 There are numerous dog agility equipment kits available on Amazon which one can set up at the home backyard for practice. If the dog trainer wishes to take a more DIY approach, home agility training can be started by using several objects found in the surroundings. For example, one can pick up PVC pipes, old tires, plywood, or cinder blocks as the hurdles. While training about home agility for dogs, it is imperative to remember that the jump in the course needs to be tailor-made so as to avoid injuring the dog. The foremost thing for home agility is to learn the basics and once it’s mastered, both the dog and the handler can then concentrate on the accuracy and speed. Home agility training is a recreational activity both for the dog as well as the handler. If the handler wishes to take part in any canine sports competition with their dog, then he/she can seek professional help. Nonetheless, one must remember never to impose any activity on the dog. Agility training is for fun and not just competition. Home agility training is an excellent form of exercise for both the dog and its handler. During the course of agility training, both the dog and the handler can experience improved communication and a strong bond. Besides, this will boost up the confidence level, make the dog more attentive and overall enhance the mutual trust. Agility training helps in instilling a boost of confidence in the dog. In the initial days, even an average dog can be scared while jumping over the obstacles. The agility jump is usually supported by bars over which the dog has to cross. So this can be started with taking baby jump steps for the dogs without out forcing them to do something that can injure them. As days pass by, owners can notice an increased level of confidence in the dogs. With this, the handler can slowly start setting jump bars from lowest to highest, as the comfort level of the dog’s increase. It is to be remembered that every dog breed with have its own way of improving trust and confidence, and they will react uniquely when jump sets are placed. Confidence and trust go hand in hand. When the level of confidence increases both in humans and canines, the mutual trust develops. As a dog handler, it is imperative to trust your dog to follow your instructions verbally while crossing complex agility rings. Even while practicing agility at home, the trust is important. Trust works both ways; your dog needs to trust your gestures and directions, and a handler needs to believe the dog’s instincts. Home agility is recreation not just for the dogs, but for humans as well. When the dog starts to take an active interest in the agility sports, they will go to the extent of pushing the handler to perform it over and over again. Although this is an important form of physical exercise for both dogs and humans, dog walking is as well important. But if the dogs are unwilling to take a walk in the backyard, home agility equipment can become hand to train and keep the dog active and healthy. Besides, agility for dogs can help to burn down the excess energy in the dogs. Agility involves a series of hurdles and obstacles which a dog need to run and overcome. Canine agility is a tedious task which requires an adequate amount of agility training before reaching perfection. Home agility training for dogs can become even more interesting when there is a competition. It doesn’t imply to compete on a club ring, rather a backyard session with two dogs will help one of them mimic the other one. Agility training with two dogs can improve confidence in a less confident dog when they see the other dog performing well on the race course. There is a tendency amongst dogs to mimic the behavioral pattern. Thus pairing dogs during agility training can prove to be beneficial and bring out a shy dog from its shell. Dogs are wild by nature. Running, hunting or chasing their prey is a natural dog’s instinct. In search of food, stray dogs are often seen to hunt down preys while crossing through the several natural barriers. Dogs in general, have the inbuilt capability to climb steep slopes, jump over logs, and to squeeze through vegetation and bushes. So leveraging this natural dog instinct, home agility training can be beneficial for the dogs to satisfy their desires and drive. Time is essence for dogs, so while training for agility, a dog will try to finish it in the given course of time. In this fast-paced world, where every individual is running a rat race, it is almost impossible to take out time for concentration on one’s fitness. But with agility training, the dog, as well as the handler, can improve their fitness level. This is because, in agility sports, a handler is required to run along with the dog to direct him verbally. Agility is thus a great form of cardiovascular exercise for a human. Agility is a type of canine sports, meant for the recreation of the dogs. But before getting started with home agility training, it is imperative to understand that agility can impact a dog’s joints. Thus, a dog needs to be physically active to take up on agility training. Introducing a dog to agility training must be performed gradually. Initially, before the training for agility starts, the dog can be made to walk a variety of surface. Starting to jump on agility boards at this stage can injury the limbs and joints of the pet. Once the bones and muscles of the dog get strengthened, it is best to start off with the agility training which includes jumping and crossing hurdles. 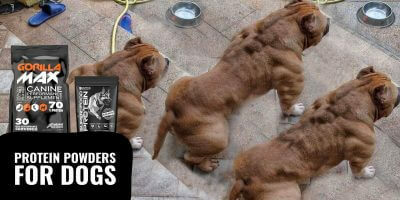 To boost the muscle mass building, think of giving your dog protein supplements alongside resistance training and sprints. This theorem also applies to older dogs who can suffer from broken joints if pushed to perform difficult stages in agility. Because, as the dog grows older, bones start weakening and high jumps can become fatal in such case. Dog agility is a mental and physical exercise which enhances the performance level of the dogs. Moreover, while practicing agility at home with more than one dog, it is important to note that the pets should be obedient and sociable. A bad-tempered pet can, however, injure others and in itself in the course of agility training. Agility is an excellent mental and physical exercise for dogs. However, before starting off with home agility training, a few agility exercises can be performed indoor as well. This will boost up the dog’s confidence level, and the handlers can as well become an excellent guide. This adventurous exercise requires the dog to push himself through the flap that is there at the end of the tunnel. For this, one requires a coffee table or chair and a blanket. The blanket is required to be placed on the chair with one side having adequate overhanging to create a flap. Once the flap is created, make your dog walk through one side of the tunnel and pick up the other side a little in order to gesture him to cross the tunnel. Lure him for rewards and every time the dog makes a move, lower the blanket side so that the canine learns to push through it. Make the dog do a little hard work on the indoor grounds. Dogs usually tend to avoid rustling on plastic covers and grates, so as a handler one can set up small on-floor challenges for the dogs with a variety of doormat with different fabric, aluminum foil, air mattress, or even rumpled or unfolded newspapers. This exercise will help the dog get familiar with a variety of unknown surface and boost up his confidence. Gradually the dog will have enough courage to perform all rounds of agility training in due course of time. Convert the living room into a ground for practicing home agility training. Different living room items such as narrow shelves, broomsticks, rolled-up blankets, or empty floral boxes can become obstacles for indoor agility training. Living room obstacles will help the dog learn jumping over the hurdles. The hurdles should be arranged in a way that the dog can’t pass underneath. It is important to encourage your dog initially. To motivate, the handler can as well jump with him. When the dog gets accustomed to the idea of jumping, the handler can use verbal words such as jump to instruct the pet to jump over. Agility is a famous canine sport which involves a series of hurdles such as jumps, weaves, tunnels, along with guided navigation for the dog to run and cross them. For setting up an agility training at home, one must initially set up a backyard course with weave poles, jumps, tunnels, see-saws etc. PVC pipes are the most important while building the home agility training course. Other than that, pipe straps, pipe tees, screws, woods, and caps will also be required. As the name suggests, an A-frame hurdle requires two broad agility ramps with a dimension of 3 feet wide and 9 feet long. Both the ramps should be hinged together and raised so that the hinged frame is nearly 6 feet from the ground level, roughly forming the A shape. A contact zone painted in bright yellow at the bottom of both the ramps will indicate that the dog needs to place his paws before descending and ascending the frame. Before practicing home agility on an A-frame, it is best to set up the horizontal ramps in accordance with the size of the dog. The dog can get frightened with steep slopes, so it is best to increase the height of the A-frame gradually. In order to enhance the agility performance of the dog, a dog walk can be helpful. For this three wooden planks of approximately 30 com wide needs to be connected at the ends. The middle plank can be raised by height if 4 feet from the ground level. The other two planks will form the agility ramp to help the dog reach the top and bottom of the center planks. The dog walk is as well beneficial in enhancing the balancing ability of the dog for agility training. Tunnels are an integral part of home agility training for dogs. For this, a vinyl tube measuring about 20 feet in length and 2 feet in diameter is used for the dog to run through it. Initially, it can be a straight line tunnel, but once the dog has built up its confidence, more curves can be added to increase the obstacles. A tunnel enables the dog to learn how to crawl through the pipe and push himself out of it. For home agility, it Is imperative to remember that the tunnel should be spacious enough for the dog to pass through easily. A closed enclosure can often frighten the dogs. While setting up home agility training course, jumps form an integral part of the exercise. Agility jumps are usually bar-shaped hurdles which the dogs have to cross over. The height of the jumps is determined upon the size and flexibility of the pet. At home, jumps can be created with inexpensive PVC pipes. When placing the jump bars, there must be enough space for the canine to jump between the uprights and over the bar. It is best to look out for portable, lightweight jump bars so that even if it is knocked down; the dog doesn’t hurt itself. Agility is a recreational sport in which jumps of various types can enhance the dog’s physical endurance. Panel jumps are a series of agility bars placed vertically, which dogs have to run and cross over. 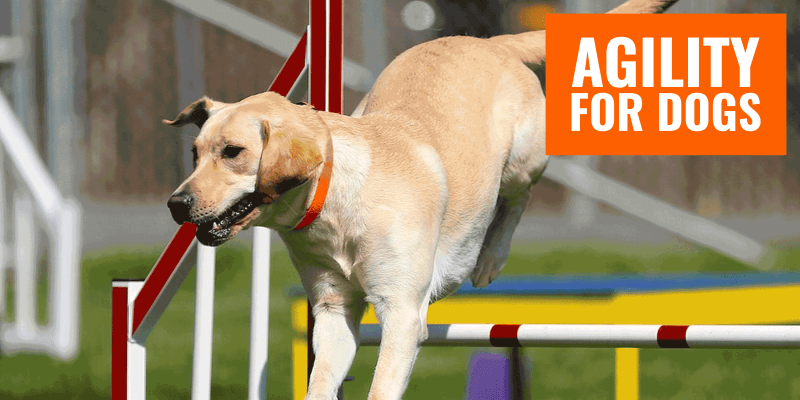 As for double, triple and spread jump, agility bars are spread horizontally on the race course and dogs need to cross them without touching the platform. Handlers can place spread jumps which include two or three horizontal bars placed on two upright bars and are spread with adequate distance from each other. In case of double jump the bars are placed parallel or in ascending horizontal order. However, in the case of triple jumps bars the space between the spread of the bars are adjusted on the basis of the dog’s height. 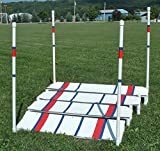 For practicing panel jump, the agility bars are not placed horizontally. Instead, they are placed upright on the ground which the dog must cross over. These bars can be a set of small to medium bars depending on the size of the dog. Broad jump or long jump is an agility exercise which can be practiced only when the dog is confident enough about the jumps. In case of long jump agility training, a broad area with four or five slightly raised platforms is set up. The dog must cross this entire duration without touching any of the platforms at one go. The length of the broad jump is however adjusted based on the height of the dog. The broad jump will require adequate training before practicing; otherwise, there can be a chance to incur fatal injury to the dog. For a smaller dog, the length of the broad jump should be built smaller. Tire jump is another type of agility obstacle which requires a tire with an approximate size of 18 to 24 inches diameter and must be suspended in a frame. Like any other agility jump, the dog is required to jump through the opening of the tire. The height of the jump is again determined by the size of the breed. To enhance visibility, it is best to wrap the tire with fluorescent tapes. This will also help in covering up any opening or uneven places on the tire surface. This agility exercise requires much practice before the dog can accomplish it in one go. A pause table is an agility obstacle on which the dog must stay still for a specific count of seconds. A square platform of approximately 3 foot by 3 foot is elevated so that the dog can jump on it and sit down for a particular time span in a down or sitting posture. The height of this platform is usually based on the height of the dog. Generally, its height range can vary between 8 inches to 30 inches. Pause box is a variation of pause table. The name suggests that the dog must use its pause behavior while crossing this hurdle. For pause box training, a square is marked on the ground with tape or pipe. Inside this mark, the dog has to sit quietly for nearly 5 seconds. Weave poles are a series of pipes placed at a diagonal distance while forming a center straight line for the dog to dodge the poles and reach the destination. These are a series of upright poles nearly 10 to 12 with a height of 3 feet and spread over a distance of 24 inches apart from each other. The dog has to enter the first pole and keeping its focus straight at its goal he has to dodge in between the other poles while staying in the center line. The faster he can pass through, the quicker he will reach the goal. 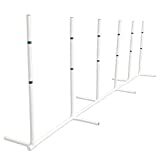 At home, agility training weave poles can be made from PVC pipes. But an important aspect is that there must be adequate spacing in between the poles for the dog to run around. Here are some of the basic procedures and precautions to keep in mind while starting off with home agility training. The main outlook of the agility training is to entertain the pet while developing its physical endurance. Initially, it is best to keep the agility session small so that the dog doesn’t start to lose interest. Once the dog develops an interest, then the time span of the training can be increased. During the course of agility training, there is always a chance that the dog fails at its first attempt to cross a hurdle. As a handler, one must never show disappointment in the dog. Instead, encourage them or take some baby steps before trying to achieve success. This will instill confidence in the dog, and the same mistake won’t get repeated again. Dogs are not human. They won’t understand what you, as the handler, wants the first time around. As a dog trainer, one must have immense patience to make the pet understand your gestures and verbal directions. It is important to be expressive with the dog so that mutual trust and bond is created between the canine and the human while carrying out the task. Every one of us waits for appraisals. 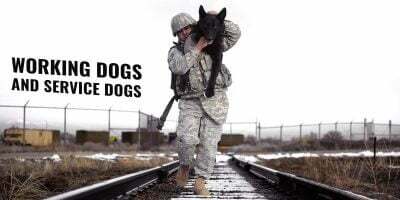 Canines are as well no different. So while training the dog for agility sports, it is essential to praise them on their every achievement, even if it’s a small obstacle which they have crossed. This will enhance their confidence level and urge them to perform better. The canines get motivated to perform a task when they receive a reward. Usually, dogs can be bribed with the reward of food. So upon completion of one set of hurdles, if the dog receives his reward, he will be motivated to do the next. Here are some of the frequently asked questions in relation to agility training for dogs and the benefits of having home agility equipment. Agility is one of the most recreational activities for dogs. More than canine sports, it is an excellent method of training and building physical endurance of the dogs. Do agility is often performed at local clubs, but if a dog handler has enough space in the backyard, a home agility training course can be set up there. This will not only make the dog comfortable in performing in known ambiance but will improve the trust and bonding between human and dog. For setting up the agility course, the ground can be of grass, dirt, or special matting. fAs for the hurdles, handlers can use various home equipment to set them up as obstacles. Most importantly, jump, weave, and a tunnel is the fundamental obstacles in agility. Jump bars can be set up using the PVC pipes, while tunnels must be spacious enough for the dog to pass through it. Besides, it is imperative to patiently train the dog to understand the verbal directions and gestures of the handler, so that in due course he can become an expert to compete in agility sports. For setting up A-frame agility equipment at home, one requires two wooden planks, with a measurement 8 feet in height and 3 feet in width. Apart from this, door hinges, screws, hook bolts, wood glue, nails, paints, and pool handle are required to set up the A-frame. The ability ramps should be cut at a 45-degree angle so that the bottom of the plank rests well on the ground. Join the two planks with hinges and screws and elevate them in the shape of an A-frame nearly 6 feet above the ground level. Paint it in vibrant color to attract the attention of the dog. Train your dog to climb up the plank and then descend slowly. The height of the A-frame can be determined based on the flexibility and size of the breed. While painting the frame, sand can be used to add texture for providing better footing on the top of the plank. This will also prevent the accidental falling of the dog from the top. Consistent obedience training and using different agility course designs often will improve a dog’s agility performance. Agility involves immense hard work both mentally and physically for the dog and its handler. The agility performance cannot be improved overnight. This is a show process wherein the handler has to train the dog to understand the verbal communications patiently. Initially, a dog is required to cross baby hurdles which will enhance the level of confidence before attempting for higher ones. Communication is the key in case of agility. The stronger the bond grows between the handler and the dog; the better will be the agility score. Next are the accuracy and speed. This again won’t happen overnight. But with an adequate amount of practice and motivation, the dog can achieve a particular hurdle at record time. Besides, the physical fitness of the canine is of utmost importance. Agility includes overcoming such hurdles which can adversely impact the joints and muscles of the pet. Therefore, before improving the agility score, enhancing the physical endurance is more important. Nonetheless, proper guidance, practice and exposure of the dog to the outside world will enhance the performance level. Jumps in agility training for dogs are clearly determined by the size of the breed and its flexibility. Agility jump is an integral part of the agility training for the dogs. Jumps are usually created with cylindrical pipes placed on other two upright pipes on the ground. The dog is required to jump and cross the hurdle without knocking it down. However, it is to be remembered that all breeds are not of the same size and doesn’t have identical physical flexibility. Therefore, before placing the jump, it is important to calculate the size of the dog. A too high jump obstacle can lead to a fatal injury for the dog. As there are chances that the dog might fail in its first attempt, therefore, the pipes should be lightweight so that even if knocked out, they don’t cause any physical injury to the pet. With time and practice, the height of the agility jump can be increased eventually. It entirely depends upon an individual as to how he/she wants to set up the home agility training course. For the basic, it is important to have jumps, weaves, and tunnels as obstacles. One can purchase them individually at the initial level, but as the dog starts to develop its courage to perform better, a dog agility equipment kit can become helpful. 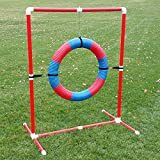 There are several dog agility kits available in the market such as affordable agility in the bag, agility beginner bundle, dog agility equipment package, and agility gear starter package with the tippy board. All these equipment kit comes with a set of hurdles required to perform agility at home. Purchasing them can be beneficial as it is cost effective and will as well aid in improving the physical fitness of the dog because a variety of hurdle means a variety of challenges to be performed. Agility is one of the most engaging canine sports which help in developing the trust and bonding between the pet and its owner. It is a challenging task to overcome all the hurdles built in the agility course only by understanding the verbal commands of the dog handler. Agility is usually practiced in clubs, but if it can be set up at home with adequate dog agility equipment kits, then it becomes easier for the dog to open up to the challenges in a friendly environment. But given a thought, dog agility involves immense risk for your beloved pet. If the hurdles placed are not tailor-made according to the size and flexibility of the dog, then it can lead to fatal injury of joints, muscles, and limbs. Agility is for fun, so it should never be imposed on the dog. If the dog enjoys the agility training like a game, it can overcome the hurdles with ease. However, the safety of the dog is of utmost importance in any canine sports.